We slip into a small bay off the western coast of the Antarctic Peninsula, the great tongue of dark rock and glistening ice that ends about 670 miles south of Cape Horn, and drop anchor just as it starts to rain. Big drops slick the decks of Golden Fleece, the sailboat on which we have taken several long journeys to Antarctica and surrounding islands in search of animals inhabiting this immense polar wilderness. During a lull in the storm, we motor in a dinghy to a rocky island and land near a colony of Adélie penguins, elegant in their jet-black "jackets," snowy chests and white feathers encircling their eyes. Only small Adélies and their larger cousins, the emperor penguins, live in the parts of Antarctica where the ocean freezes. We crouch on a wet rock to watch. All around us, adults returning from fishing forays slide in the deep red guano muck, trying to feed their ravenous brown chicks. The usually fuzzy chicks are wet and covered in mud. Many carcasses of youngsters are trampled into the goo. Soon, the rain is back. Persistently wet summers are new to the peninsula, as are the stretches of balmy, clear days that alternate with the rainy periods. The average annual temperature here is now about 5 degrees F warmer than just 50 years ago. This unusual weather signals what we already know: Our planet's climate is changing fast. Although natural climate variations are normal, the current warming is the first driven by human activity. And it is happening so fast that some animals are struggling to cope and facing massive declines or extinction. The most vulnerable species are those with narrow ranges, especially sea-ice dependent animals living near the poles. 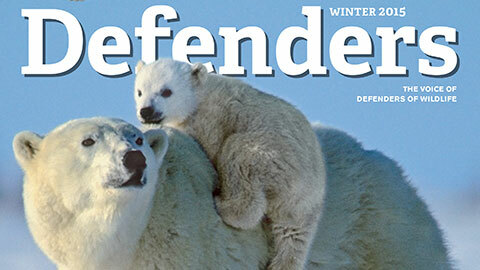 Penguins, polar bears, pikas and other creatures will benefit from Defenders of Wildlife’s work on global warming. Defenders is working to enact federal cap-and-trade legislation to reduce greenhouse gas pollution that causes global warming. At the same time, Defenders is leading efforts to enact measures that will help wildlife and ecosystems survive the global warming already underway. In 2007, Defenders worked with Congress to establish the National Climate Change and Wildlife Science Center. The center will provide the science necessary to develop and support measures to safeguard wildlife and ecosystems from global warming. This year, Defenders worked with Congress to increase funding for the center and to require Interior Secretary Ken Salazar to begin developing a national strategy for assisting wildlife and ecosystems in the face of global warming. Visit the global warming section for more information and take a look at Defenders’ public service announcement on penguins and global warming. Among the best-known of those sea-ice dependent critters are emperor penguins, the charismatic birds that have lately taken a star turn on movie screens. Besides emperors and Adélies, there are 15 to 17 other penguin species (depending which scientist you ask) scattered around the Southern Hemisphere. All of them are flightless and rely on their exceptional swimming and diving skills to catch mostly small fish, squid and krill. Among the scientists who study these birds is David Ainley, an ecologist with the California-based consulting firm H.T. Harvey & Associates, who has been researching penguin populations on Antarctica's Ross Island for 40 years. Lately, Ainley and his colleagues have been looking at the ways these penguins cope with environmental change. Techniques as varied as satellite telemetry, microchips, "penguin cams" and bones help them predict how the birds may adapt. "The Adélies are one of the world's best-studied wild birds," Ainley says. "They are the bellwethers of environmental change." A case in point: the dead Adélie chicks we see during our onshore foray. When the chicks are too big to be brooded by their parents, but have not yet grown their water-repelling feathers, rains can soak them to the skin. If the temperature then drops below freezing, the drenched chicks die of hypothermia. Another hazard to rearing young is snow. The rising temperatures that bring more rain to the western peninsula also result in more snowfalls, since warm air holds more moisture. Adult penguins mired in snow during breeding season still try to incubate their eggs, which are too wet and cold to hatch. Despite these hardships, the penguins are hardwired to nest in the same location each year, and may stick to it until the colony is gone. Many Adélie penguin colonies have already disappeared in the western Antarctic Peninsula region. The colony on Litchfield Island vanished recently, and the number of Adélie breeding pairs on nearby Biscoe Island has declined from 2,800 to less than 1,000. The reasons for these declines go beyond soaked chicks and frozen eggs. Mainly, the pack-ice-deendent penguins are running out of pack-ice. In addition, the changing weather is affecting krill, an important penguin prey. These shrimplike crustaceans are so abundant in Antarctic waters that their collective weight is estimated to exceed 500 million tons, roughly twice the weight of all humans on the planet. This bounty sustains not only many penguins, but also seals, whales, squid and fish. Krill, however, depend on sea ice the way cows rely on meadows: These creatures graze on nutritious algae growing underneath icebergs and ice floes. The retreat of sea ice in the western Antarctic Peninsula region makes these "ice meadows" less available, depleting krill numbers. Climate change has been affecting the movement and location of sea ice, which we watch and hear each day aboard the Golden Fleece. We see large floes carrying reclining crabeater, Weddell and leopard seals. We circle icebergs with their transient populations of gentoo, Adélie and chinstrap penguins. The glacial ice flows in thick rivers from the alpine ridges of the peninsula, breaks into huge slabs and towers, and crashes into the Southern Ocean. Its chunks rub against our boat's hull when we slide into our bunks at night. Come morning, it is often gone, blown away by the wind. As the sea ice breaks apart and drifts, it can create obstacles for penguins when they attempt to walk from breeding colonies to the sea for feeding. For example, in 2000, the world's largest known iceberg, 150 nautical miles long and known as B-15, calved off the Ross Ice Shelf. Breaking apart and grounding, it prevented much of the ice in the western Ross Sea from disappearing, as it normally does each summer. "For five years, broken ice slabs piled against the shore all summer, interfering with penguins' access to open water," says Ainley. "The ice made it difficult for clumsy emperor penguins to get to sea or return to feed their chicks. More agile Adélies fared better, but the birds of some colonies expended much energy to reach the open water where they dive to feed. The colony on Cape Royds on Ross Island quickly decreased from 4,000 breeding pairs to 1,800 breeding pairs, with few chicks produced between 2001 and 2005." As the sea ice retreats and disappears, the penguins that depend on it are disappearing as well. Dee Boersma, a conservation biologist and renowned penguin expert from the University of Washington, visited the French base in East Antarctica, the site of the emperor colony featured in "March of the Penguins." She came in 2006, only a year after the film was made. "I went to observe the colony," she says, "but when our ship anchored on December 20, I saw no sea ice and no colony." Boersma learned that a few months before her arrival the remaining emperor parents, whose colony already had shrunk by half since 1974, had to leave their usual nesting site and march their half-grown chicks more than three miles to more stable ice. But this ice was destroyed by a powerful storm blowing the floes and the chicks out to sea, and most likely causing the reproductive failure of the entire colony. A few penguins may benefit from the warming conditions on and around Antarctica. For example, gentoos, stocky penguins with white stripes extending like bonnets across the top of their heads, are now spreading southward with the retreating sea ice. Bill Fraser, an ecologist and president of the Montana-based nonprofit Polar Oceans Research Group, has been studying the birds nesting in Arthur Harbor on mountainous Anvers Island in the western Antarctic Peninsula since 1974. During this time, the ice-dependent Adélies have greatly declined, while gentoos increased. "This used to be a polar environment," Fraser says. "Now the subantarctic ecosystem is sweeping in and replacing the polar system. When I was a student, we were told about climate change but also that we would not live long enough to see it. The change we witness today is beyond anyone's wildest imagination." And the mounting challenges posed by climate change are not the only ones threatening penguins. Boersma has studied Magellanic penguins, medium-sized birds with two black bands between the head and the breast, at Punta Tombo, Argentina, for 25 years, documenting the decline of their large population by 22 percent since 1987. Every year, Punta Tombo birds and other temperate penguin species die by tens of thousands in oil spills and fishing nets, get run over by drivers near their breeding colonies on land, starve due to commercial overfishing, and must swim farther from their nests to find food. Because of the many perils facing penguins, the Bush administration last December proposed adding six temperate-zone species—yellow-eyed, white-flippered, Fiordland crested, erect-crested, Humboldt and southern rockhopper—to the threatened species list, and one—the African—to the endangered species list. It declined, however, to propose listing three other penguin species—including the emperor. While extending Endangered Species Act protection to penguins is an important step, it won't directly reduce the peril to these birds. The root causes of the problems facing penguins—and other wild creatures—are simple, says Boersma, but people are reluctant to address them. "There is a huge elephant in the room, but no one is talking about it," she says. "We produce too many children. We consume too much. But politicians do not get re-elected if they approach this subject." "We are out of balance with our environment and need fundamental changes to improve it," Boersma adds. "We need more protected marine areas, a smaller carbon footprint on land, and less production and consumption. If we can't manage ourselves, both people and penguins will suffer." Yva Momatiuk and John Eastcott are wildlife photographers and writers who often travel to the Antarctic and other remote locations. Their book for children, Face to Face with Penguins, will be published by the National Geographic Society in the fall. Global climate change could spell disaster for some South American birds as more rain and warmer temperatures cause the populations of parasites that plague them to explode. Penguin populations have decreased by nearly 80 percent in some areas. You can help. Adopt a penguin.